Kurume City is a big city with a population of 500,000 and located in the center of Chikushi Plain in the south of Fukuoka Prefecture. 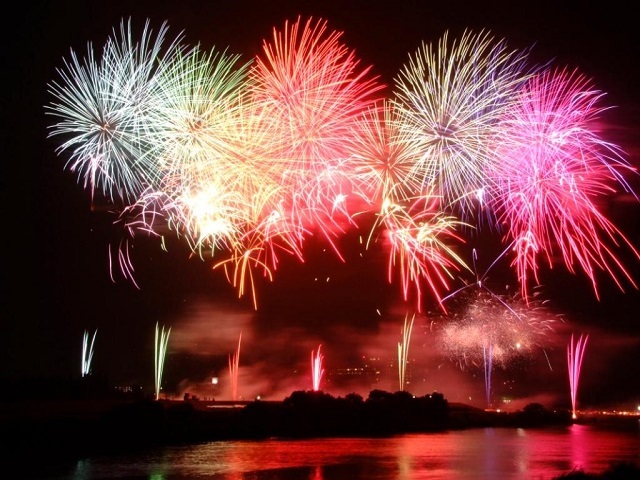 The Chikugo River crosses the Chikushi Plain, the fireworks display held here is the biggest in the West Japan. It has a long history of beginning in 1650, 18000 fireworks launched from the two spots on the Chikugo River light up the summer night sky. 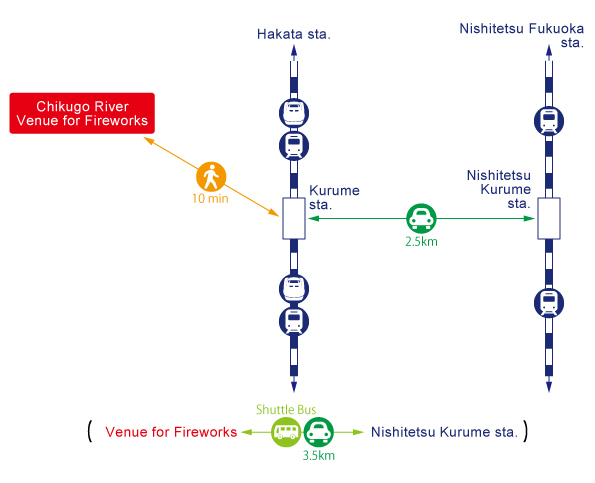 Shuttle buses will take visitors to six different watching spot from Kurume Station. Driving a car is not recommended because it is crowded on the way. The frequent Kyushu Shinkansen and Nishitetsu Trains are available at Fukuoka Hakata Station. To Kurume station.14 minutes from Hakata Station by the Kyushu Shinkansen. 25 minutes by the JR Kagoshima Line from Hakata Station. 30 minutes from Tenjin Station of the Nishitetsu Line by the Nishitetsu Tenjin-Omuta Line. 45 minutes from Fukuoka Intl Airport with 1 or 2 buses per hour. 1 hour from Hakata Station.